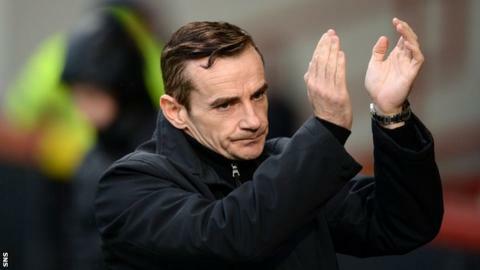 St Mirren boss Danny Lennon feels the draw with Partick Thistle at Firhill was a "fair result". With both sides in danger of slipping into the relegation play-off spot, Kenny McLean's penalty cancelled out Kris Doolan's opener. "The two teams contested the game well but I didn't think it was a game for the purists," said Lennon. "I'll praise my players, going a goal down away from home and to show the character to get back into the game." Lennon said his side's comeback "speaks volumes for the team spirit that's there". Thistle felt aggrieved when Kallum Higginbotham was penalised for a foul on Jason Naismith in the box, with McLean rifling home from the spot. "It was a wee bit of a distance for my contact lenses to see that far," said Lennon of the award by referee Calum Murray. "Thistle, in terms of owning the ball in the first half were probably looking the more threatening in terms of going forward. "I thought Doolan did particularly well; always trying to stretch the game. We didn't seem to get a rhythm and didn't seem to get any momentum and were giving possession away. "We created one or two opportunities, particularly coming from the left-hand side. Kenny McLean's in fine form and is very confident. "It [the draw] keeps our momentum going and I think it's four that we're unbeaten. We've got three games to go now and, at this moment in time, we find ourselves out there in front. "There are three very important games still to come. There will be a lot of twists and turns between now and 10 May. Hopefully in a few weeks' time we'll be over that line."